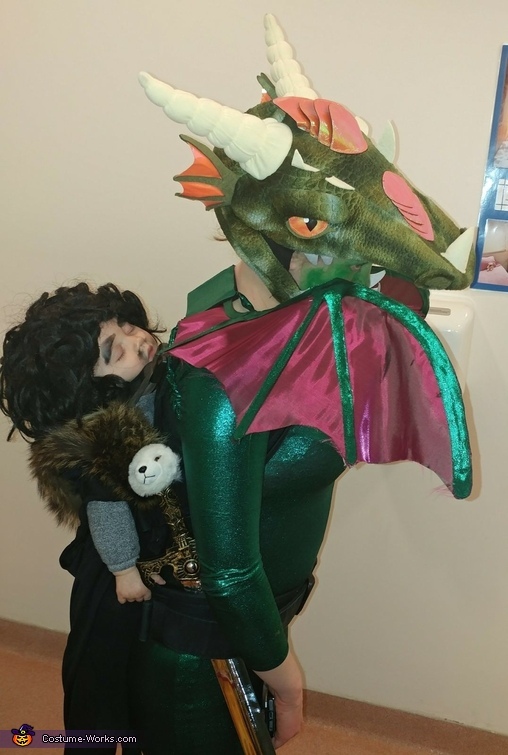 I'm a huge fan of the hit HBO show Game of Thrones, and I decided that while my daughter was young (6 months old), I'd take advantage of her obliviousness to Halloween and do a mother-daughter costume. I had a blast planning this. Obviously, I needed to make sure it was comfortable for babe, so the Jon Snow wig is actually sewn onto the hood of sweater, and the fur cape is tied around the baby carrier, with Longclaw (the sword with the stuffed bear pommel)tucked into the carrier waistband. There were tiny black boots, but she kept kicking them off, so I didn't make her wear them. My costume was done on a budget, with the bodysuit and wings costing $40, and the headpiece $25. My daughter ended up falling asleep for most of the Halloween festivities, but was awake long enough to take Grand Prize in our community's Halloween costume contest.